To nourish and enrich the lives of individuals in Yolo County with emphasis on those age 60 and older, by providing nutritious meals to active and home bound people; thereby, promoting their health, well-being and independence. Meals on Wheels Yolo County (People Resources, Inc.) has been providing a daily hot meal to seniors in Yolo County for over 40 years. Freshly prepared hot food is delivered to sites in Woodland, West Sacramento, Winters and Davis. There, about 2/3 of the bulk food is packaged for home delivery by volunteers. Seniors look forward to their meal and to the personal attention of a familiar visitor. The other 1/3 of the food is plated and served to seniors who travel to the 4 senior centers to socialize over lunch. Our organization needs volunteers to deliver meals and a friendly smile each day to seniors, particularly in our most difficult to serve communities. We also need volunteers in other areas, such as clerical, helping us care for our fleet of delivery vehicles, helping in our five kitchens, etc. 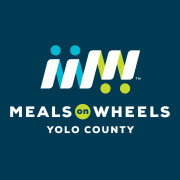 Would you recommend Meals on Wheels Yolo County? This is just such an easy way to volunteer and make someone smile. You don't have to be extremely crafty to write a few nice words on some paper. Taking a few minutes to do something nice for someone will not only make their day, but yours too!